The two presidents also issued a joint statement on the occasion of the 25th anniversary of bilateral diplomatic relations. Several documents on expansion of bilateral cooperation between the states have been signed in the presence of President of Ukraine Petro Poroshenko and President of Lithuania Dalia Grybauskaitė who is on a working visit to Ukraine, according to Poroshenko's website. The agreement between the Ministry of Ecology and Natural Resources of Ukraine and the Ministry of Environment of the Republic of Lithuania on cooperation in the sphere of environmental protection has been signed by Minister of Ecology and Natural Resources of Ukraine Ostap Semerak and the ambassador of Lithuania to Ukraine, Marius Janukonis. The Memorandum of Understanding between the Ministry of Health of Ukraine and the Ministry of Health of Lithuania has been signed by Acting Minister of Health of Ukraine Ulana Suprun and the ambassador of Lithuania to Ukraine, Marius Janukonis. The Protocol on Cooperation between the State Labour Service of Ukraine and State Labour Inspectorate of Lithuania has been signed by the head of the State Labour Service of Ukraine, Roman Cherneha, and the ambassador of Lithuania to Ukraine, Marius Janukonis. 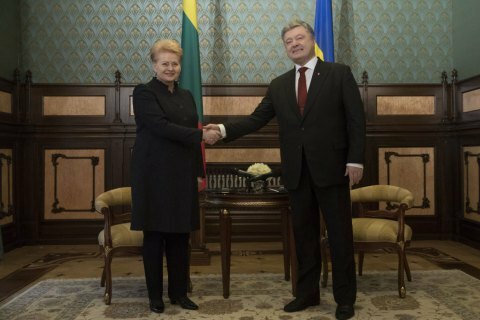 Poroshenko and Grybauskaitė also made a joint statement on the occasion of the 25th anniversary of bilateral diplomatic relations. "Ukraine and the Republic of Lithuania have officially gained the level of strategic partnership. Our states have been demonstrating a permanently high dynamics of political dialogue, effective practical interaction in political, economic, scientific, technical, cultural, and humanitarian spheres, active cooperation on the issues of implementing the Ukraine-EU Association Agreement, and Ukraine’s course towards European and Euro-Atlantic integration," the statement reads. The sides condemned the occupation of Crimea and the city of Sevastopol by the Russian Federation and its aggression in Donbas. "We call on the international community to continue active political, diplomatic and other efforts for restoring Ukraine’s territorial integrity in its internationally recognized borders in the interest of stability and security of the entire Europe," the two leaders said. On 6 December, Lithuania denied entry for Russian Constitution Court judges over rulings on Crimea.